The vendor’s field service management product is one of the many industry-specific solutions under QuickBooks Enterprise, the powerful and high capacity offering of the popular accounting product. What distinguishes Enterprise from other QuickBooks platforms is its advanced features designed for the unique business needs of various industries like manufacturing and wholesale, construction, retail, and non-profit. FSM falls under the purview of QuickBooks Enterprise, offering sophisticated but easy-to-use tools to seamlessly connect service managers and administrators with their field technicians. QuickBooks Enterprise FSM is a web-based platform an ideal tool for businesses that need to efficiently manage their service personnel in the field such as HVAC companies, plumbing and electrical repair services, and power and utility firms, among others. There are many features and capabilities offered by the software foremost of which are real-time field updates, job scheduling, and on-location invoicing. It is able to deliver instant information on technician schedules and work orders as well as track work hours and location. It ensures that field service personnel are on their job and doing what they need to do according to schedule. When service has been completed by technicians for the clients, the former can issue invoices on-the-spot for the latter. The smooth process made possible through QuickBooks Enterprise FSM not only connects your service technicians with your office but also lets you schedule more jobs and get paid quicker without having to worry technician productivity, work status, and receivables. Best of all, all your field service data and financial information are synced on all the devices you use in the and your office workstation. This gives you flexible control and dynamic management over the important elements of field service – your people, clients, cash flow, costs, and everyone’s time. Field service business is a fast-paced operation. You should be able to quickly respond to urgent service requests from customers. How fast you can deliver on service spells the difference between loyal customers and lost clients. QuickBooks Enterprise FSM allows you to easily take stock of technicians’ schedules whether you need to reshuffle or reassign work orders. It empowers you or your dispatcher to leverage information such as each technician’s location, status, and work orders. If you need to respond to a sudden client request but your technician for the day is not around, it takes a simple drag and drop to assign a work order to a new technician. You get a bird’s-eye view of what each technician is working on, the work status, and the time spent on the job. You’ll even be able to view and edit job details with a simple click of the mouse. Through integration with Google Maps, you get to monitor technician’s travel time, arrival time, and hours clocked in order to optimize work and schedules. With work time data gathered through the FSM software, you can populate your QuickBooks weekly timesheet and streamline payroll processing through a time card add-on module. Wireless work orders eliminate the hassles of paperwork and the associated bottlenecks. Your field technicians will no longer be running around with clipboards, pens, and notebooks. These traditional tools are replaced by FSM’s mobile apps on Android and iOS phones and tablets. This means improved control processes and instant information on schedules, reassignment, and work orders alongside real-time access to customer profiles and service history. If the situation calls for it, technicians will be able to make intelligent decisions and data-backed judgment calls while in the field. You get online centralized storage for all data and information on your equipment service, contacts, and customers. Information is the game change in today’s digital age and for field service, quick access to information is needed in order for technicians to do the job right the first time around. Before going out to deliver service, your technicians are well informed of the service history of the equipment at hand so they can achieve better first-time fix rates and provide optimal service to customers. You know what satisfied customers mean – loyalty, repeat services, and new customers (by word of mouth from your happy clients). QuickBooks Enterprise FSM integrates with other QuickBooks products such as QB Pro and QB Premier as well as with Merchant Services and Advanced Inventory and Reporting. You get extended functionality with merchant services which allows you to improve cash flow and save time by processing payments in the field using the FSM mobile app. Meanwhile, you can tap advanced Inventory and reporting tools to track and manage truck and warehouse inventory and synchronize inventory placed on an invoice to shorten the invoicing process and do away with the need to reconcile later. Enterprises have different needs and requirements and no software solution can be just right in such a scenario. It is useless to try to find an ideal out-of-the-box software app that fulfills all your business needs. The smart thing to do would be to modify the system for your specific needs, worker skill levels, finances, and other aspects. For these reasons, do not rush and pay for well-publicized trendy solutions. Though these may be widely used, they may not be the perfect fit for your unique requirements. Do your homework, investigate each short-listed system in detail, read a few QuickBooks reviews, call the maker for explanations, and finally choose the product that presents what you require. 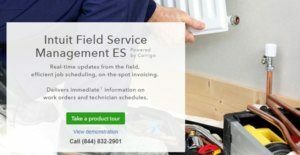 We realize that when you make a decision to buy Field Service Management Software - FSM it’s important not only to see how experts evaluate it in their reviews, but also to find out if the real people and companies that buy it are actually satisfied with the product. That’s why we’ve created our behavior-based Customer Satisfaction Algorithm™ that gathers customer reviews, comments and QuickBooks Enterprise reviews across a wide range of social media sites. The data is then presented in an easy to digest form showing how many people had positive and negative experience with QuickBooks Enterprise. With that information at hand you should be equipped to make an informed buying decision that you won’t regret. QuickBooks Enterprise FSM integrates with QuickBooks Pro, QuickBooks Premier, QuickBooks Merchant Services, and key tools of QuickBooks Enterprise such as Advanced Inventory and Advanced Reporting.